Passengers on an American Airlines flight from Burbank to DFW a couple of weeks ago may have wondered what was causing a woman in the cabin to laugh hysterically. That was me. 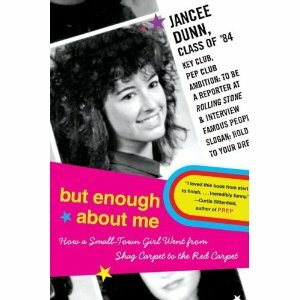 And the source of my outbursts was the memoir by Jancee Dunn entitled But Enough About Me: How a Small-Town Girl Went from Shag Carpet to the Red Carpet in which Dunn intersperses episodes of her career as an interviewer with Rolling Stone and MTV2 host with vignettes of her quirky New Jersey upbringing. In one installment, she describes the horror of having to interview Bono with a huge zit on her forehead. While interviewing Madonna, she tries to conceal her intimidation while seizing an opportunity to check out her bathroom. Meanwhile Dunn dates a succession of hippie slackers and drug-addled music producers only to discover that hipness is a full-time job for which she could only work part time hours. Dunn's fondness for interview subjects such as Grace Slick, Stevie Nicks, and Dolly Parton is palpable. By contrast she is traumatized by Jennifer Beales, who dresses her down in a restaurant for asking a question deemed too personal, thus teaching the valuable lesson of grabbing the check BEFORE asking the difficult questions. Though temporarily exiled from her family while trying to please a hip loser boyfriend, she renews her bond with her mother by taking her on a gay cruise to interview Rosie O'Donell, where they are encouraged by diet guru Susie Powter to get in touch with their vaginal energy. This is a breezy read with valuable lessons and a happy ending as Dunn meets the man she initially spurns but eventually marries. But getting there is half the fun. Highly recommended!